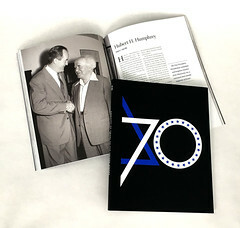 For the 70th anniversary of the Israeli Embassy in Washington in May 2018, we were asked to design a commemorative photo book and a logo. The book honors 70 Americans (or groups of Americans) that have supported Israel over the years. Each received a spread of photos and a short biographical essay. The book is not offered for sale; it was distributed as an exclusive gift by the embassy. This was a big project, on a tight turnaround, and everyone were very pleased with how it turned out. If you would like to see more of this or discuss doing something similar, please contact us. We took advantage of a rare quiet moment, while everyone’s busy watching the Comey hearings, to add several publication projects from the past many months to the portfolio. You can see these, logically enough, on our Portfolio page. If you click through to the portfolio on Flickr, you can download full PDFs of most of these projects and get beyond the pretty covers to the hard-working interiors. If you like what you see, get in touch! We’d love to hear from you, or perhaps design something similar for you. 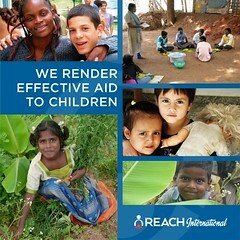 REACH International, a 40-year-old charity based in the Washington, DC area that sponsors children in developing countries, asked us to redesign its logo and create a new fundraising brochure. The organization is small but has global reach, and its existing identity was dated and looked rough and unprofessional. Starting from the existing concept—a child embraced in an adult’s arms—we explored various geometric shapes that could be used for the “arms.” We eventually settled on an oval as the simplest and most evocative. 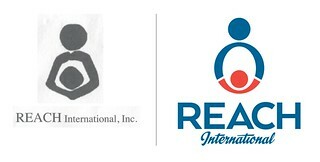 Making it taller than the original logo made it less of an embrace and more like the child is reaching up, like they’re holding hands. Adding the breaks to the oval made the adult-child relationship more explicit and allowed for differentiation by color. Modern, lively typography and bright colors completed the transformation. As always, we then built it out in various orientations and formats. For the brochure, REACH wanted something that would resonate beyond the charity’s traditional, religious base and appeal to younger, more secular donors. We worked with Deborah Brody of Deborah Brody Marketing Communications, who crafted key messages and descriptions that could be used throughout the organization, as well as brochure copy that encouraged donations and sponsorship. Lively photos and the organization’s new, brighter color palette reinforced the change. See the full brochure here. 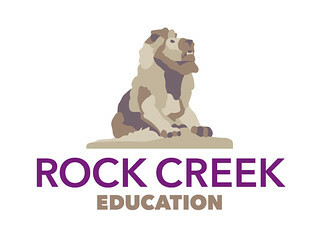 Sensical Design created this logo for Rock Creek Education, a startup nonprofit that will advise state and district policy makers on education policy as well as work with middle school and high school math teachers on improving their teaching. David Wakelyn, founder of Rock Creek Education, suggested a design based on the historic Taft Bridge, which spans Rock Creek Park at Connecticut Avenue, near the organization’s office. We proposed several options related to the bridge, its iconic barrel vaults and arches. Another key feature of the bridge is the stone lions that guard its approaches. One of those lions was kind enough to model for this colorful icon, which ended up being the selected design. 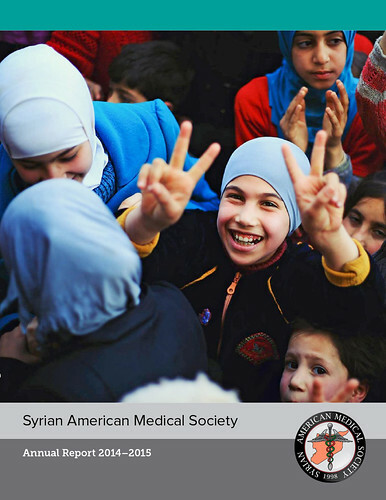 The Syrian American Medical Society is a nonprofit organization that has been supporting life-saving medical care during the Syrian civil war, both in Syria itself and in refugee camps in Lebanon, Turkey, and Jordan. The organization asked Sensical Design to create its 2015 annual report. The report is 48 pages and filled with dramatic photos and stories from the field, as well as chilling statistics (178 health workers were killed in Syria in 2014). We strived to create a publication that was lively, approachable, and easy to understand, while still being appropriate to the serious subject matter. Kathleen Fallon, the SAMS Advocacy & Communications Manager, said, “Dan Kohan and Sensical Design created amazing and high quality work for our annual report this year. Dan was wonderful to work with, creating a unique design that perfectly highlighted our programs and mission. Despite our short timeline, Dan was extremely flexible, and his work was efficient and high-quality. We highly recommend Sensical Design and hope to work with them on another project in the future!” You can download the full report here.